In hypnotherapy, an affect bridge is a way of linking feelings in the present with feelings in the past. But if an affect bridge were a bridge in real life what form would it take? Mark Leckey has free associated a bog-standard graffiti strewn motorway crossing. It’s an icon we never knew existed, until we saw the six foot scale model bathed in sodium light here in Cubitt. This is a bridge seen at speed from the back seat of an Austin Allegro. You are moving too fast to read all the writing on the sloping walls, although the banks invite you to get out and climb. 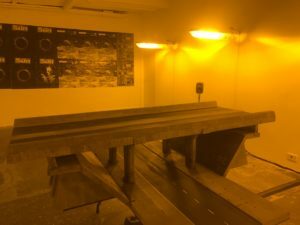 The show allows you to explore the mystery of the humble underpass: what it might mean for both Mark Leckey and any grown adult who drove past a similar vehicle. In the gallery, though, it is a sculpture. The eye is led in two separate directions: through and across. It is a cruciform piece, so within the context of Western art, this is a kind of crucifixion. The soundtrack is as jubilant as a second coming. Tribal drums underpin a page-long list of elements which the artist wishes to cast “OUT!”. Leckey recites them like manifesto points. It was Kraftwerk who best captured the rhythmic qualities of a motorway. The rhythm in here is as infectious as the sickly golden light. There is a push-pull dynamic as strong as an individual’s past. The flatly horizontal bridge begins to resemble an analyst’s couch. This is someone else’s session, a very public session, but this piece transcends the artist’s personal biography, while remaining sincere. Affect Bridge Age Regression can be seen at Cubitt, London, until June 30 2017.